THE COUNTERJIHAD CALENDAR RECOGNIZES TODAY AS MOTOON DAY……. – The Tundra Tabloids……. 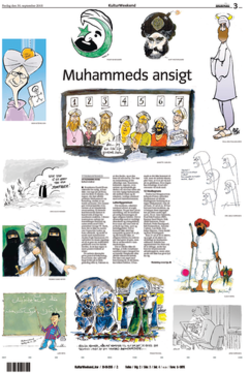 Yes ladies and gentlemen the Counterjihad calendar recognizes today as the day, exactly five years ago, that the Danish newspaper, the Jyllands-Posten, published the dreaded pictures of Mohamed, that set off the entire Muslim world (six months later that is) in a spitting rage, after imams living in Denmark had toured a number of different Muslim capitals, spreading false information about why the Jyllands-Posten did it, as well as providing a few more provocative drawings of mohamed that were not a part of the original twelve. Previous Post Previous Post ABBAS’ CHIEF NEGOTIATOR: ISRAEL TO BLAME FOR BREAKDOWN IN TALKS……. Next Post Next Post AL-FATTAH OFFICIAL IN TV INTERVIEW: PEACE IS JUST A MEANS TO DESTROYING ISRAEL……. Buy something Danish. It'll make you feel better. Even Islam seems insignificant when you've got a Carlsberg in one hand and a Danish bacon sandwich in the other.